Craftin' Caro: October e-newsletter, projects and contests! October e-newsletter, projects and contests! Have you received my October Newsletter yet? If you are Canadian, be sure to sign up HERE to receive my free monthly e-Newsletter! 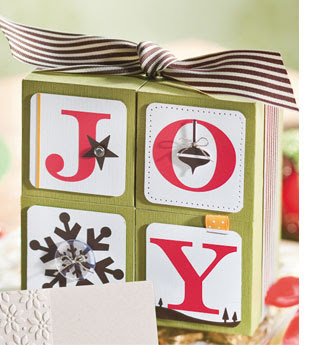 This month's includes great project instructions (such as for the Joy Blocks shown here), a Sweet Treats video, specials and an exclusive Holiday contests for my subscribers only. Yes, I'm giving away an "O Christmas Tree" Stampin' Up! Bigz Xl Popup Die, (valued at $57.95) as part of my holiday card contest, but ONLY newsletter subscribers who participate will get a chance to win! Please note that the studio is CLOSED all weekend for the Creativ Festival, however I will re-open as usual Tuesday the 20th.